‘Take the pressure as pleasure. You will not feel it but enjoy it. Who hasn't pressure in this world? I too have pressure but I take it as pleasure which tests my capability to come up, not to give up. The pressure which is given by your teachers is to make you moulded and to prepare you to face the challenges in your profession. You have to take it as an opportunity to prove yourself’ thus said Dr. D. Veerendra Heggade, Dharmadhikari of Dharmasthala and Chairman, SDMIMD, for the question ‘How to handle pressure and depression?’ during the interaction with the new batch of PGDM 2017-19 students. Dr. Heggade suggested the students to do yoga regularly, pranayama for few minutes and an hour of meditation, to come out of any level of depression. The two-day trip for the young managers was packed with visits to Shanthivana, Ratnamanasa, Bahubali Hill, Vintage Car Museum, Manjusha Museum and Dharshan of Lord Manjunatheshwara, the main deity of Dharmasthala. 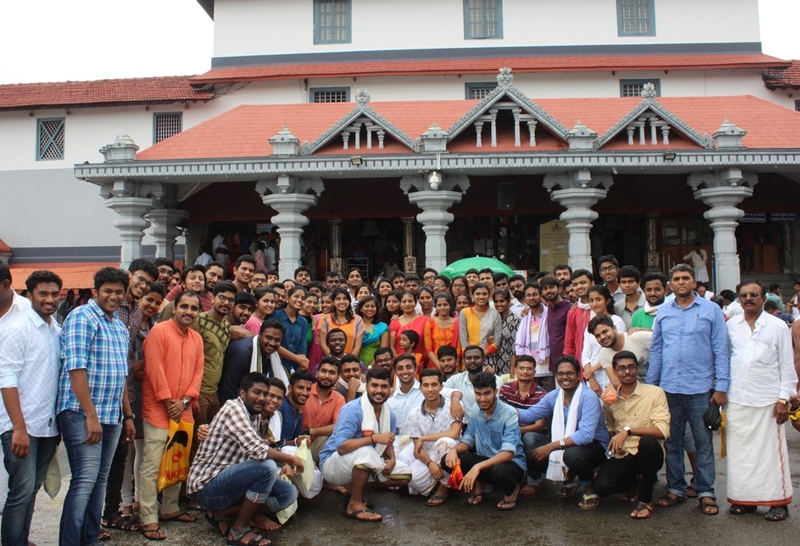 Students enjoyed the traditional hospitality and food in Dharmasthala. The students were introduced to the administration and management of various activities of pilgrimage place and social upliftment programs during the trip.